"Supreme Council of Antiquities SCA Secretary- General Zahi Hawas said that the foreign expertise was used only for transferring the statue according to the terms of a tender declared by the SCA after the process of restoration was carried out by the Egyptian company" (State Information Service). "Thierry Benderitter has put up some new pages on his El Kab site:The tomb of Paheri:http://www.osirisnet.net/tombes/el_kab/pahery/e_pahery1.htm . This publication is the most complete illustrated publication on this tomb since 1894, to my knowledge. The tomb of Ahmes son of Ibana:http://www.osirisnet.net/tombes/el_kab/ahmes/e_ahmes.htm You can find on the page the complete renowned autobiographical inscription. The repository temple of Amenhotep III:http://www.osirisnet.net/tombes/el_kab/e_el_kab.htm"
This article by UK broadsheet The Independent summarizes what is known about Tutankhamun to date, in advance of the release of the Egyptian mummy scan results. This is a good and timely overview of what has been learned since Howard Carter first found the young Pharaoh's tomb. Magnetic Cures in Ancient Egypt? "Back in ancient Egyptian times and beyond, it is likely that the original idea of magnet therapy stemmed from the unusual effects of natural stones. " Modern studies may back the idea that magnetism can help to alleviate some medical conditions. The site is looking for contributors who meet their standards. There are no more details, but this page does contain a photograph of the mummy casing, showing the face and the vivid colouring. The exhibtion currently touring Europe and the US will be visiting the UK in 2007. Featuring over 50 items from the Tutankhamun collection, as well as 80 items from other royal tombs in Luxor, it will be hosted in the Greenwich Dome. The article describes some of the items that will be on display. In addition, the article mentions in passing that Tutankhamun's mother died giving birth to him - I have no idea where they got that from. This article says that the mummy of an admininstative official was found still sealed in its coffin, and in perfect condition. It was found by Japanese excavators in Dashur. The iol website holds a small description of the mummy. "The Polish mission at Kom Al-Dikka in Alexandria has made several exciting finds over the years, but their latest discovery hard on the heels of the establishment of the Bibliotheca Alexandrina has set tongues buzzing. Grzegorz Majcherek, director of the Polish-Egyptian mission which has been excavating at Kom Al-Dikka for the past 40 or more years, insists that overzealous journalists have rather too hastily linked this latest discovery in Alexandria to the ancient library. " A detailed description of the recently discovered lecture halls, and what archaeologists have managed to conclude from them. "Few contest the fact that the dead must be dealt with respectfully. Yet it seems as though Dr Zahi Hawas, Secretary General of the Supreme Council of Antiquities, has a different point of view." This kicks off an article about the differing views within Egypt of Hawass's approach to the scan of the Tutankhamun mummy. More detailed information about the threat to Luxor and Karnak by rising Nile waters - this item goes into some of the chemical processes involved in the damage. Customs officials in Jordan have foiled an attempt to smuggle Pharaonic statuettes out of Egypt. The Tour Egypt website are reporting that prices to ancient Egyptian tourist attractions have been raised. Increases are between 40 and 175% at all major centres in Egypt, including Alexandria, Cairo, Luxor and Aswan. The above page gives actual details of the price changes involved on a site by site basis. I posted about this some weeks ago - ancient Egyptians faking cat mummies. I wouldn't have posted about it again, because as far as I can see there is nothing new in this article, but for the fact that there is an x-ray photo accompanying this piece. 138 items have been catalogued in Abzu during the period 1 December - 31 December 2004, and the full list is posted, with links to each item, at the above linke. If you haven't come across ABZU, it is located at http://www.etana.org/abzu/. In their own words, ABZU is a guide to the rapidly increasing, and widely distributed data relevant to the study and public presentation of the Ancient Near East via the Internet. Although, mainly devoted to the Near East, Egypt is covered as well. This is a great resource. I can't imagine why the Indian Express has chosen to roll with this story when no-one else appears to be featuring it, but it focuses on the serious problems that are being faced by the Egyptian temples of Luxor and Karnak in terms of rising Nile waters. The article reports that waters have risen by up to 5 ft, "submersing the base of the renowned columns and jeopardising the foundation. The salt has faded the brilliant colour of the temples and the exquisite statues flanking the columns". The Travellers in Egypt website has been updated recently with an article about Robert Hay. A long and fascinating article, it discusses Hay's life in the context of his travels to Egypt and his activities while visiting there during the late 1820s and early 1830s. His work was never published in full, but he did detailed architectural plans. "In the spring of 1834, Robert Hay sailed away from Egypt for the last time. He had spent more than eight years recording the ancient temples and tombs along the Nile, not merely with sketches and brief descriptions, as earlier travelers had done, but completely, with architectural plans and detailed copies of the murals and inscriptions. It was a vast project, one of the most thorough ever undertaken in Egyptology’s early days". The site is well worth a visit, and I'll add a link to it on the Egyptology Portal site. Dated 16th January, this feature from Jimmy Dunn, a Tour Egypt regular writer, discusses emails recieved through the Tour Egypt site concerning "alternative" theories of Egyptology, mainly concerning the Giza pyramids and the Sphinx. He cites a particular website, which he says demonstrates lack of even basic knowledge about Egypt, and offers a number of ways in which Egyptologists differ from alternative theorists in their interpretations. Zahi Hawass in his Al Ahram column talking about foreign missions to Egypt, explaining some of the SCA regulations for foreign missions applying to work in Egypt, and the reasons for them. He also addresses an accusation that he read that 35 missions had been refused the required permissions. A lengthy and interesting article about the smuggling of antiquities, various Egyptian announcments and policy statements on the subject, the role of museums and auction houses in the problem, and the valuation of individual items. "From 23 January to 6 February, the Egyptian Museum in Tahrir Square, Manial Palace in Roda, the Greco-Roman Museum in Alexandria and the Alexandria National Museum, will each play host to over 200 children who are expected to come in search of insights into the mysterious and fascinating lives of their ancestors. The aim is to take what was once a dry topic confined to the history text books and bring it alive for the younger generations." See the article on Al Ahram's website for more information. When you click on "Enter" the site loads a slide show with photos of Hawass next to various Ancient Egytian landmarks, but you can skip this by clicking on the "skip" link to the bottom right. The site has various articles, updates, speeches that Hawass has given, and a schedule of upcoming lectures. There are details about site management, and a piece about the Shinx controversy. Definately worth a look. Daily progress reports for at least four different ongoing Johns Hopkins projects in Egypt are anticipated Jan. 15 through mid-February. For the fifth year in a row, the Web site will follow the work of Betsy Bryan, Alexander Badawy Professor of Egyptian Art and Archaeology and chair of the Near Eastern Studies Department at Johns Hopkins, and her graduate students. The site documents their excavation and research projects with photographs featuring Bryan’s detailed captions." "Ahmed Saleh, the director of SCA’s Abu Simbel antiquities department watched with the rest of the world as Hawass made his discoveries in Bahareya on December 13th, 2004. 'That was a real joke. How can a scientist hold an axe and just hack at a tomb on air? All scientists know that a lot of processes should precede the opening of a tomb. If you just hack away at it you lose important historical evidence. I am sad that this is what Egyptology has come to,' Saleh says". This is a real fun article about both the Bahariya oasis live excavation and the recent Tutankhamum CT scan. Well worth the read. "Several rejuvenation projects undertaken by the Ministry's Supreme Council for Antiquities (SCA) will be inaugurated by the end of this year, including the temples of Al-Sibou'a Wa Omda in Aswan at a total cost of L.E. 10 million". A little more information is provided in the article, above. Zahi Hawass was video'd at the CT scan of Tutankhamun's mummy, saying that it would be unwise to dismiss the idea of the curse that was supposed to have haunted the original finders of the tomb. He cited a number of minor misfortunes including the scanner being offline for nearly two hours, and the wind blowing up the Valley. A number of studies into the curse have, however, gone to some lengths to prove that curse is nothing but a myth. This article contains some more descriptions of the CT scan of the mummy, and has a photograph of Hawass and some of the CT screen with the mummy in the tomb. "A series of documentaries narrated at the tongue of ancient Egyptian kings will be produced under an agreement signed between the US National Geographic Institution and the Supreme Council for Antiquities (SCA). The kings will relate secrets of their lives part of which will be revealed through a state-of-the-art scanning device which the SCA obtained from a well-known company" (SIS website). As per usual, I am not quite sure whether SIS has said precisely what it meant. The article goes on to talk in brief about the Tutankhamun discovery. Apart from the sensationalist lead paragraph, this is not a bad article. It starts off "A team of researchers briefly removed King Tut's mummy from its tomb Wednesday and laid bare his bones for a CT scan that could solve an enduring mystery: Was it murder or natural causes that killed Egypt's boy pharaoh 3,000 years ago?". And it quotes Hawass quite extensively, but it explains what the CT scan could achieve, what has been attempted before and why it is not being done in Cairo, amongst other things. Hawass says that the results will be published later this month. From the SIS: "While restoring the Farama Citadel in northern Sinai, members of the Supreme Council for Antiquities (SCA) uncovered an Abbasid soldiers' residence and a textile plant for military outfits, along with a mill and water reservoirs. Al-Farama, situated 35 kilometers northeast Qantara Sharq city, was brimming with citadels, fortresses, mosques, monasteries and palaces belonging to Pharaonic, Greek, Coptic and Islamic ages. The newly discovered rooms differ in area and shape; some are 1.80m x 8.10m, others are as large 3.15m x 3.15m. 1.8m-deep underground rooms thought to be used for grain storage were also unearthed. A circular structure made of burnt bricks with some ashes inside has been called an ancient oven. The textile plant was a significant find, said Secretary-General of the SCA, Zahi Hawass. Opposite holes were found in facing walls which were apparently used in fixing wooden bars that functioned as looms." I'm off to CRE VI at Cambridge for the next few days, so the site won't be updated until Saturday or Sunday. But I'll back-track when I get back and make sure that no news items slip through the gap. "A Musical Romance, the lavish, revitalized pre-Broadway production of the legendary musical that tells the tale of King Tut's mystical and magnificent stepmother Queen Nefertiti, will have its grand opening performance at Ft. Lauderdale's Parker Playhouse on Saturday evening, May 7th, 2005. Previews begin May 4th. Tickets are now on sale". Heaven help us. From the Leuven website: "Leuven for the 7 th Egyptological Tempeltagung. The theme of this year’s reunion concentrates on the relation between architectural practice and theological theory. The erection of a temple required the commitment of a great number of trades. From the worker in the quarries to the architect on the building site, from the theologian in the House of Life to the engraver on his scaffolding, each of them contributed not only to the construction of a building but also to the structuring of religion. The 7 th Tempeltagung wants to examine the relation between the construction of the building and the construction of theological thought. Where were materials procured, how were they transported and placed in position? Who commissioned and who paid for temple construction? Who made the decisions and who executed them? How is architecture influencing the ritual, how do ritual texts reflect the act of construction? What is the relation between the mythical temple and the actual temple? Can archaeological finds confirm texts like the foundation ritual? What technical and theological considerations lie at the base of the choice of material and of form? These are only some of the question we would like to raise during our meeting. " "Nefertiti will be removed from the converted guard house on March 2 to take up temporary residence at the Kultur Forum exhibition hall at Potsdamer Platz in the revivified centre of Berlin. There, she will form the focal point of a six-month exhibit on Egyptian hieroglyphs and their influence on art up to the modern day. If all goes according to plan, Nefertiti will be able to move into the newly rebuilt but anachronistically named Altes Museum (Old Museum). But even the Altes Museum is only temporary lodgings for her. Her original digs in the nearby Neues Museum will be ready by 2008 or 2009." Recent excavations at a Roman porphyry mine "have not only revealed the well-preserved quarries and the dwelling places of the quarry men, but have also revealed thousands of ostraca, that is potsherds with inscribed messages, that provide fascinating details of how the quarrying took place, and of how the quarrymen ordered their food - some for themselves, some for their wives on the Nile". "The Ministry of Culture has completed a comprehensive project to convert the island of Kalabsha in Aswan into an open museum that exhibits monuments of ancient Egyptian civilisation. The project is an asset to tourism, especially because it allows evening visits to the splendid island through the introduction of a state-of-the-art lighting system. The Minister of Culture, Farouk Hosni, said that the island embraces distinguished landmarks, such as the Temples of Kalabsha, Beit Al Wali, Garf Hussein and Qartas. He pointed out that the restoration undertaken is to the credit of a young generation of restorers." The article in the Egyptian Gazette, at the above URL, contains more details and information. The Egyptian State Information Service has posted an item about an international finance company doing a feasibility study re the life of Hatshepsut. The article talks about what the feasibility study involves, (including visiting various potential studios and locales and meeting SCA officials), gives some top-level details about the life of Hatshepsut, and says that if she accepts the part, Catherine Zeta-Jones would be expected to take the title role. 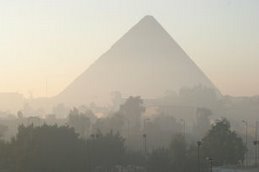 "Khafre, the second-largest of the three Great Pyramids at Giza, outside Cairo, is to reopen on Saturday after being closed for nearly two years for repairs and restoration. Workers removed graffiti inside the pyramid, repaired cracks and cleaned the walls of salt residue, the Supreme Council of Antiquities said on Thursday" (Aljazeera). See article for more. Found in New York, the items were a statuette of Anubis and a First Dynasty pottery jar. The annual graduate lecture conference is being held in Cambridge, U.K. next week. For the full programme see the CRE website at the link above. I will be attending this, so if anyone has any particular queries, let me know. According to the Fitzwilliam Museum's (Cambridge, UK) website, which I visited to plan a trip to the museum: "The Egyptian Galleries closed to the public on 4 October 2004. They will re-open early in 2006. Over the course of the next year we are renovating the galleries to improve access to the collections. We will be providing information on these pages about the work involved, as well as reporting on its progress." It does not specify whether or not access will be granted for research purposes. The site was updated on the 21st December 2004. There is no further information on the page, but there are contact details. The timing is a real shame, as the Current Research in Archaeology VI conference is being held in Cambridge next week.